What makes the Creme D'Argent rabbit so special?....the lovely beauty of its creamy white coat! Besides its sweet nature and docile personality this rabbit makes a stunning show animal. The Creme D'Argent Rabbit is a pretty variety of one of France's oldest breeds of fancy rabbit, the Champagne D'Argent. babies this was in the picture above?? A feature unique to only the Creme D'Argent and the Champagne D'Argent rabbits is that their coats change color as they age. The Creme D'Argent is born orange and gets lighter as it gets older, an old Creme D'Argent may even be quite light! The Creme D'Argent babies in the picture above still have lots of orange coloring. When they get older they will change color and become more creamy white. Creme D'Argent rabbits are generally quite calm and enjoy attention. However, despite its sweet nature and striking beauty, this breed of rabbit is rarer than many of the other breeds. The Creme D'Argent was introduced in 1934. It is just one of several color varieties developed from the Champagne D'Argent rabbit, a standard fancy rabbit raised in the region of Champagne in France for hundreds of years. The term argente meaning "silver" in French. 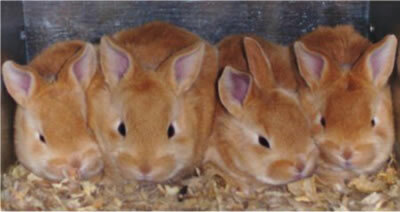 These guys are considered to be a large breed rabbit, and will weigh between 8 to 11 lbs. when full grown. They have a strong well developed round body of medium length with upright ears, and are just a bit smaller than the standard Champagne D'Argent. Their fur is short and easy to care for, but they will need weekly grooming with a slicker brush to keep it from becoming matted. Color differences: Their color is creamy-white with a bright orange cast to it. The Creme D'Argent are full-sized rabbits and can be over 10 pounds when full grown. The Netherland Dwarfs are smaller - only reaching around 2 pounds. A mix of these guys could really be any size in between that. As a breeder and exibitor of Creme d'Argent rabbits, I can say that the breed is one of the most attractive bunnies out there. More importantly, Creme d'Argents tend to be gentle and easy-going bunnies. Sadly, Creme d'Argents can be very difficult to find. The Creme d'Argent Rabbit Federation (Club affiliated with the American Rabbit Breeders Association) estimates that fewer than 1,000 Cremes remain WORLDWIDE. (To put that in perspective, more than 2,000 Mini Rex show rabbits are registered every year in the US.) I'd encourage pet owners to consider adopting one of these beautiful bunnies. "Pet quality" Creme d'Argents can often be purchased rather inexpensively from private breeders. For more information, please visit the CDRF's website at www.cremedargentfederation.com.